Nature Healing Nature is a 501(c)3 non-profit organization bringing three profoundly important programs to the world. As we take our work into the world, this organization offers an avenue for our donors, benefactors, and partners to help others help themselves. We believe that Nature offers solutions to human problems, after all, She has been successfully figuring things out for 4.5 billion years - we just need to learn how to listen and apply. Nature Healing Nature aims to help Global citizens take ownership for improving their health, living conditions and personal fulfillment using materials and lessons found in Nature. 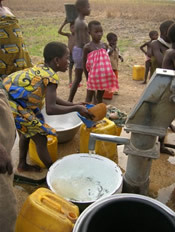 Billions of people do not have clean water to drink, over two billion people defecate outside, and billions do not wash their hands for lack of water or soap. It results in illness – usually diarrhea – over 4 billion incidents a year. Millions of man-years of productivity are lost and five thousand children under the age of six will die every day from water related illness until we do something about it. The building of large global infrastructures will take decades and billions of dollars. About a third of the billions spent in the last thirty decades has been for naught because people can’t maintain the things they’ve been given – latrines, wells and small water systems. WHO states the Millennium Goals will probably not be met by 2015 and that was to reduce the problem by only half of what it was in 2001. Nature Healing Nature offers a solution that may not be as convenient as a flush toilet or piped water to the home but it can be just as effective at eliminating water related illness. We show people how to clean their own water and build safe dignified latrines out of materials that they can find in Nature within a mile of where they are standing using skills that they are already familiar with. We empower people to help themselves. We also provide programs advancing personal fulfillment by helping youth and adults to profoundly connect mentally, physically, and emotionally to nature and their unique potential. It takes a strong technical foundation when you offer information that will change people’s lives. We’ve done our homework. Our Center for Rainwater Harvesting website is a world class data base for how to collect, clean, store and deliver water from the lowest (cheapest) technologies to the most expensive. It seems to be human nature to sentence ourselves; I’m too short, too tall, too smart, too ugly, too dumb, I’m stuck, helpless . . . it takes away our power and stifles living our unique potential. Nature Healing Nature offers safe programs that bring our self imposed sentences or masks to light then we offer ways to free ourselves of these self imposed limitations, connect with our unique potential, and explore ways to take action in a world that needs us.